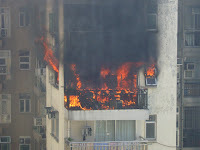 omg...thats was scary...good that is not @ our house..><''' how are u and mom and dad ad ben ben..i miss u all so much. Come to vancouver to visit me la..^^ u will like it here~hahahhaa! ben is now offically a sunbathing & sleeping master ; mom still eats a lot; dad is as slim as usual; and i'm a hardworking magazine reporter... haha. I miss you so much my girl. I hope I can come in New Year, let me see how can I arrange the schedule. Talk soon.